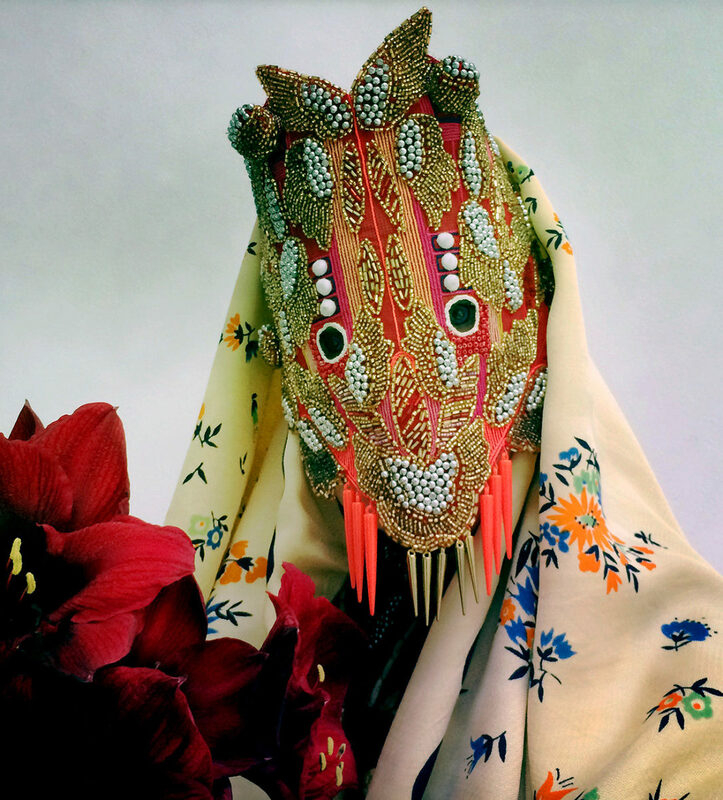 London-based Norwegian artist Magnhild Kennedy, perhaps better known by her pseudonym Damselfrau, is a self-taught maker of masks, traversing the lines between art, design and craft through a practice she is not keen to define. Her approach is decidedly unpretentious and guided by a magpie-like eye for beauty. “I am led by the phantasms appearing in the process of the making and the materials themselves. These guide my decisions and inform the objects I make,” she explains. Something Curated spoke with Kennedy to learn more about her work. Something Curated: Could you introduce us to your practice? Magnhild Kennedy: I make masks. I mainly work with textiles, sewing and beading, often integrating old and used materials. I use basic techniques I have learned from books and YouTube. I don’t draw, design or plan; I just sculpt. When I finish a piece, I take a self-portrait and send it out on Internet highways like Instagram and Tumblr. There the masks find their identity and make a life for themselves. SC: How did you get into this field and what drew you to masks to begin with? MK: They emerged alongside making outfits for clubbing, many years ago. I made a few masks for a New Year’s party, and the format stuck with me. 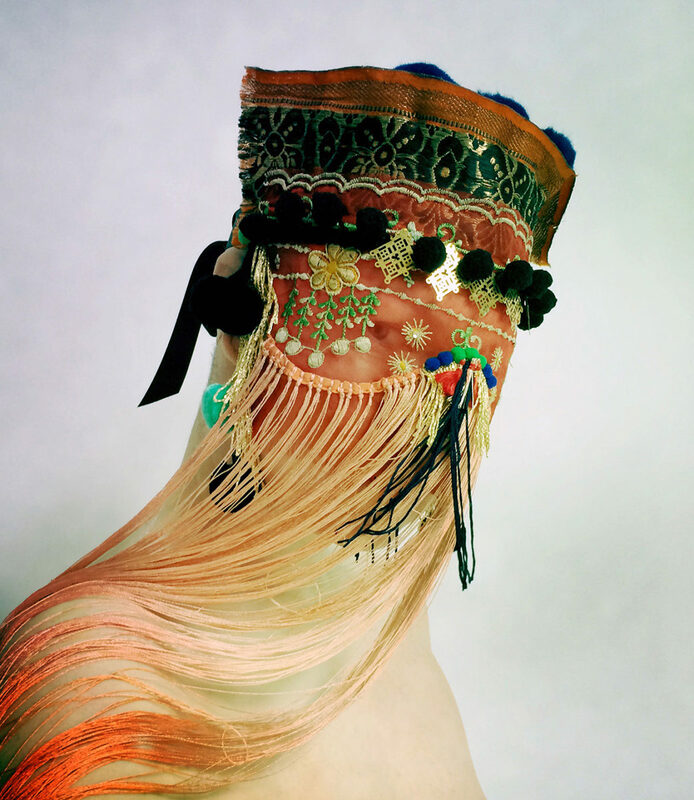 I am a collector type – ribbons, lace, ornaments, bits of textiles and old custom jewellery. The masks gave me a place to gather all these things I keep collecting – anything with a personality. I don’t mind if it’s broken. Sometimes it’s even better if it is. Then it already comes with information that helps lead me in the making. For me it’s more like making a sculpture. I have never had a particular interest in masks. SC: You’ve talked about the mask being “a place” – could you expand on this idea? MK: Well, I’ve tried to make sense out of why I keep making these things, as I don’t particularly look at them as masks but more as sculpture. They need more elements to become a mask than what I can offer. They become themselves when they meet others who project their experience on them. The materials come together, the wearer and viewer have an experience and that’s where the object exists. SC: Are there certain materials you gravitate towards and why do you think that is? MK: Nothing particular, for me there is really no hierarchy amongst materials. I’ll use whatever. But I do get a buzz if I find an old piece of beautiful textile at the bottom of a box for a quid at a car boot sale. SC: Do you have a favourite project that you’ve created? MK: My solo show Idios in 2015, the first big one we produced on our own. Me and my husband Robert set it up at Dalston Pier Studio in London. Friends rallied and helped with everything from hammering the set to PR. I learned a lot from that experience. The work grew a great deal on the back of that project. SC: What is the thinking behind the name Damselfrau? SC: Can you tell us about what you are working on at the moment? MK: I’m working on a solo exhibition for the National Museum of Decorative Arts – Trondheim in Norway. It’s my first big show in my home country so I’m very excited about it. It opens in September. MK: Tony Duquette’s Dawnridge by Hutton Wilkinson and Thomas Schütte: Houses. Feature image: Peercifor (Courtesy Damselfrau) | See more of Damselfrau’s work here.